Kampa double air bed has an exclusive airlock one way valve system – guaranteed leak free, makes inflation and deflation quick and easy. The luxurious non-slip flocked top surface is soft to touch. The air coil construction provides strength and firmness with 40 individual coils for superior comfort. It has a puncture resistant PVC base and includes a puncture repair kit.Not just for camping holidays, these beds are great for unexpected staying guests and remove the need for permanent spare beds for sleepovers. 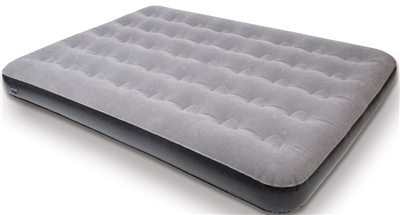 These airlock airbeds are suitable for indoor and outdoor use. No loss of air in four days. Perfect size for two children.